AUSTIN, TX— August 18, 2009 — Academy Award®-winning screenwriter, director and producer Steven Zaillian will be presented with the Distinguished Screenwriter Award at the 16th Annual Austin Film Festival & Conference, October 22-29, 2009. Steven Zaillian will be presented with the award during the Awards Luncheon on Saturday, October 24th, at the Austin Club. The Awards Luncheon is funded by AKR Foundation. In addition, Zaillian will be a featured speaker during the Festival’s four-day Conference, October 22-25, 2009. 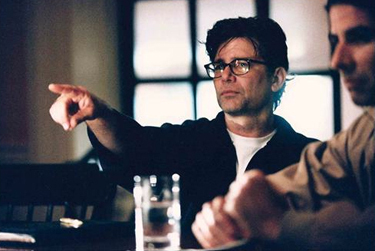 Steven Zaillian received an Academy Award® for his screenplay for Schindler’s List. His work on the film was also honored with a Writers Guild Award, the British Academy’s BAFTA Award and the Humanitas Prize. His other screenplays include the Academy Award®-nominated Awakenings, The Falcon and the Snowman, Jack the Bear and American Gangster. He co-wrote Clear and Present Danger, The Interpreter and the Academy Award®-nominated Gangs of New York. He also wrote and directed Searching for Bobby Fischer, Writers Guild Award-nominated A Civil Action and All the King’s Men. Previous Distinguished Screenwriter Award recipients were John Milius, Shane Black, Harold Ramis, Barry Levinson, Frank Pierson, Richard LaGravanese, Lawrence Kasdan, Buck Henry, Robert Altman, William Wittliff, Paul Schrader, Paul Mazursky and Horton Foote. Also at the Austin Film Festival this year, Academy Award®-winning filmmaker Ron Howard will accept the Extraordinary Contribution to Filmmaking Award. Mitchell Hurwitz, Emmy Award®-winning creator of “Arrested Development” will accept the Outstanding Television Writer Award. This year’s Austin Film Festival and Conference will host over 140 exciting premiere film screenings and events, and produce over 80 panels and roundtable discussions focusing on the art and commerce of film and television writing and production. The AFF and Conference provides registrants unparalleled access to the best writers and filmmakers in the industry. The Conference will also include representatives from Paramount Pictures, ABC Studios, Dreamworks, Josephson Entertainment, Disney Animation Studios, Kurtzman/Orci, 20th Century Fox and many more. For a complete list of panelists and events, for more information, click here or call 800-310-3378. Conference badges and film passes are on sale now and can be purchased here or by phone. Special support is provided to the Austin Film Festival by the Academy of Motion Picture Arts and Sciences®, Continental Airlines, Clear Channel Radio, KVUE, Target®, and AKR Foundation.